Sometimes, change is so gradual that we don’t notice it until we sit back and reflect. So subtle are the shifts, that subconsciously we accept the new as the original. The baseline moves – and unless we get a rude awakening we don’t notice the lack of chaffinches in the garden, or hair on the top of our heads. And before we know it, a loaf of bread costs a couple of quid and little egrets outnumber the herons. Nowhere is this more apparent than with the weather, and it wasn’t until I have sat down to consider my recent casts that I have realised just how extreme October has been. Back in the first week I was on the Wye, with Chris and Merv, chasing barbel in water that was desperately low. The fishing was hard, and the days balmy. Chris managed a brace and a half, and Merv an 8 pounder, while I satisfied myself with a string of nice chub. And by the Wednesday, we were in short sleeves and casting from the shade. A plume of warm air had billowed up the eastern Atlantic and brought equatorial air. Temperatures nudged up towards 80 and the breeze blew upstream like a Scirocco fresh from the Sahara. IT felt glorious, but the valley was crying out for rain. And within days of our departure the heavens opened and 4 metres of floodwater boiled across the spots where we had stood. My polarising glasses, that had slipped off as I waded waist-deep and disappeared beyond my desperate fingertips, would be somewhere in the Bristol Channel – adding to the plastic disaster already facing our seas. The erratic weather continued, with mild nights and gusty days. I found a late, and welcome, flush of ceps under a reliable beech tree, but just when I wanted the soft conditions to maintain, the temperature plummeted. I had been invited back to Ashmead, where I would join Andy Maple and his son Jasper in the hope of battling a monster or two. Andy had been due to fish alongside his friend Pete, but sadly Pete would be kept away as he fought a battle of his own. One of consequence that put the whims of fishing into marked perspective. 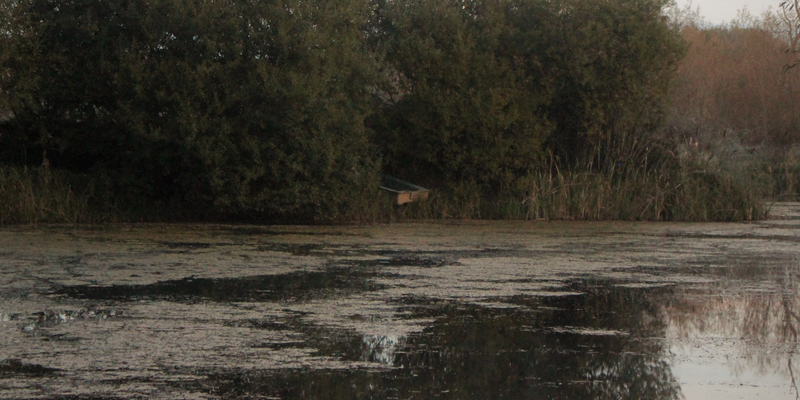 I was immensely grateful to fill his boots though, and needed little persuasion to fish in his stead. 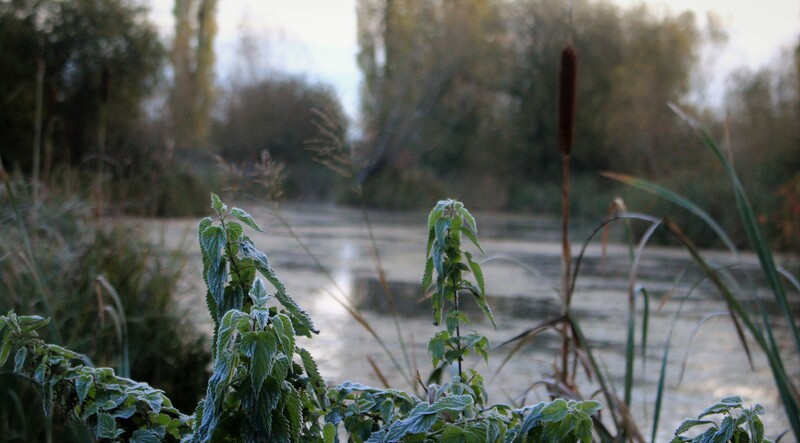 I arrived on the Levels following the first hard frosts of the autumn. On my previous visit, back in July, I had trundled down the track with the windows down and a summer soundtrack dominated by yellowhammers. This time, the hedgerows were full of fieldfare and starlings, carried in by the north-easterly blast, and more keen to eat than sing. The character of the lake could barely have altered any further. The sub-zero temperatures had left the water silent and crystal clear. I was initially unconcerned. Despite the fact almost all other anglers come to Ashmead with carp in mind, I was more interested in the perch. A couple of chunky fish caught during that summer visit had played on my mind, and stories of bigger fish seen or lost had further fuelled my curiosity. As perch hunt mainly by sight, the clear water might be a blessing, although the feeding spells were likely to be brief and crepuscular. The problem was though, that it looked for all the world as though every fish had left the water. Ashmead, so rich in life, had been deadened by the cold. I had figured, that should I find the rudd then the perch wouldn’t be far away, and yet an hour spent squinting and searching yielded not a single fin. It was extraordinary. On my previous visits I had found activity wherever I looked. A scrap or two of breadcrust would be battered within moments, and any unhardened bait would be whittled to nothing before it found bottom. Now though, the entire place had slipped into torpor. Even the kingfishers looked puzzled. Fortunately, Skeff (who owns and runs Ashmead with wife Shona) was able to point me towards a hole where I would find a couple of feet of extra depth and hopefully a fish or two skulking in the lower light. The afternoon was already pushing into evening, however, and by five o’clock, accentuated by a return to Greenwich Meantime, my float-tip was already dissolving against the black. It did dip twice, but not with any great purpose, and with the frost already prickling my toes, I went to find Andy and Jasper in order to shiver in good company. We warmed ourselves with a couple of drinks and a stunning curry (cooked by Andy), before taking the sensible option and heading for bed. It was only 8pm – and it was to be a long night. I had brought two sleeping bags and a blanket, and folded the seats down in my car to create room for quite a cosy bed. 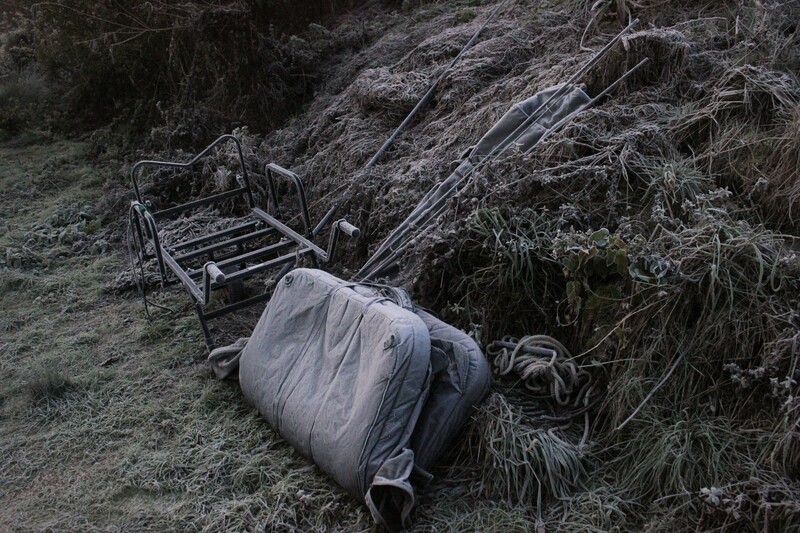 Getting to sleep proved straightforward enough, but whenever I moved, and exposed the tiniest part of myself to the cold, I would wake sharply and remain so for long periods – struggling to keep warm, while also feeling stifled by being fully clothed,gloved and hatted. The water bottle that I had taken sips from before I drifted off had frozen solid, as had the condensation that lay heavy on the windows. The night was arduous, and I was grateful to see the first fingers of dawn smudging into the eastern sky. 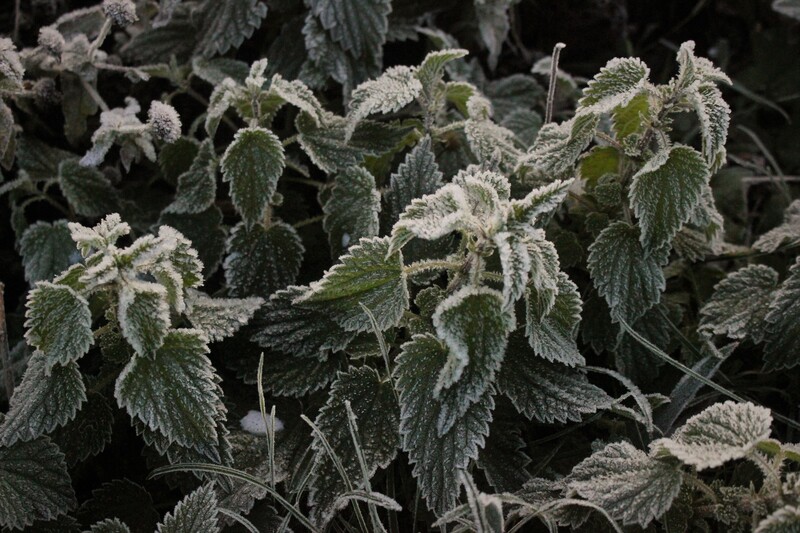 A bubbling Kelly kettle and 2 cups of tea later, I was able to appreciate Ashmead’s frost-coated splendour. 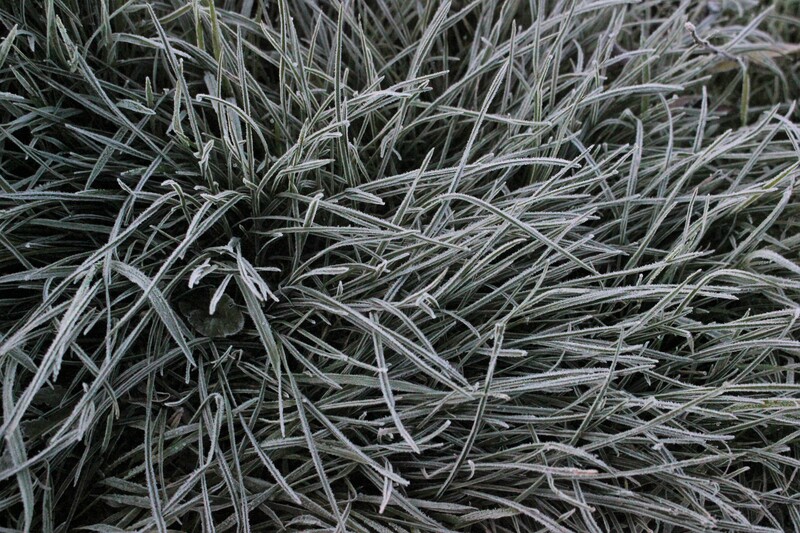 In the soft morning hue, the frost had yet to glisten. Instead it coated every surface like a sugar glaze, a delicate but seemingly brittle edging that smoothed the sting of the nettles and sharp spikes of teasel. I found Andy awake and crisping bacon and sausages in the pan. A waft that soon lured Jasper from the comfort of his bed. The three of us ate gratefully, before Andy followed the food with mugs of freshly brewed coffee, warmed with a slug of Glenlivet. We knew the carp wouldn’t feed. We knew the rudd and perch would prove almost as elusive. 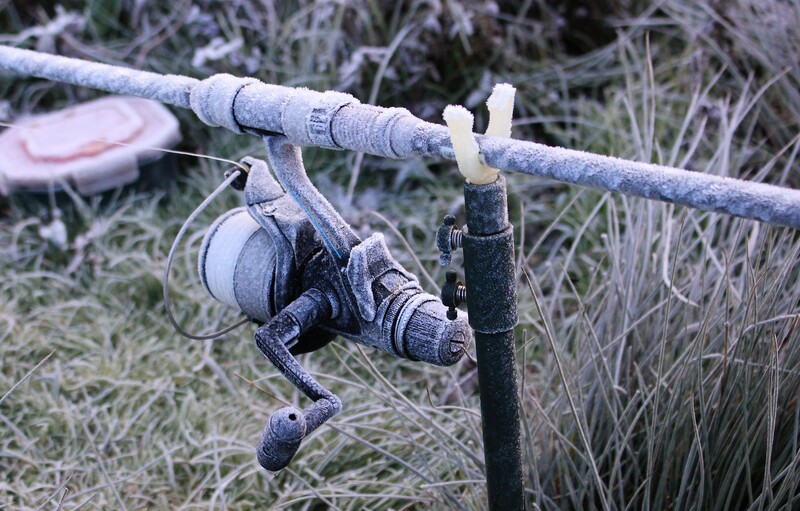 But as is so often echoed, there is so much more to angling than catching fish. I raised a private toast to Pete – thank you – and savoured my coffee. It was going to be a good day.